You may have seen some breathless, excited headlines cross your social media feeds Super Bowl weekend exclaiming that the big game would feature (or had featured) the first cannabis ad in its history. If you're more of headline skimmer than a reader, I'm here to harsh your mellow. As we reported in these pages Jan. 24, CBS refused to accept more than $5 million from Acreage Holdings to run what, in fact, would have been the first cannabis advertisement to air during America's most popular television spectacle. What everyone got so hyped up about is what's been billed as the first-ever paid sponsorship for a CBD product to be featured at the event. 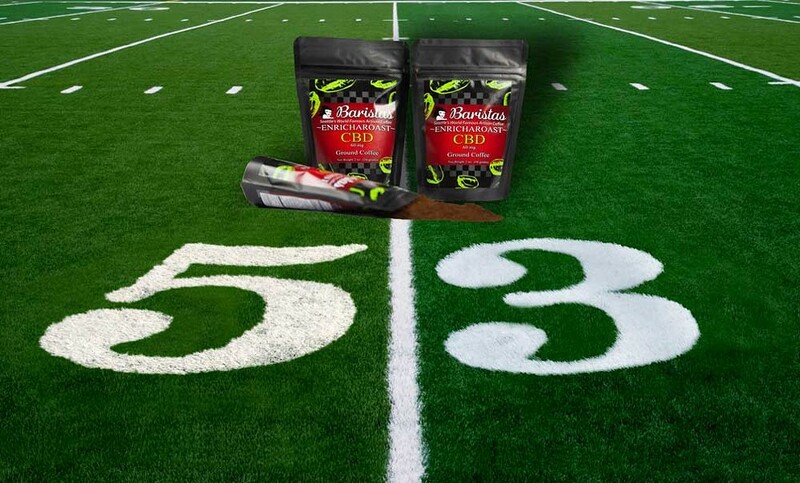 Here's what happened: television screens in Atlanta's Mercedes-Benz Stadium included an advertisement for Baristas coffee company's CBD Coffee. The advertisement, viewable only to the 75,000 or so attendees of the big game, featured a "special offer allowing them to send a 120-character message to Maroon 5, which headlined the halftime show, via a digital platform on their phone. So instead of a medical cannabis advertisement pumped out to some 100 million television viewers, a CBD coffee got plugged to about 75,000 people who, if they paid attention, could then send a message to Maroon 5 singer Adam Levine telling him to put his goddamn shirt back on. I'll join SpongeBob fans in saying this was far from a "Sweet Victory." In case you missed it, last month the California Growers Association quietly dropped its lawsuit challenging the state over a regulatory loophole that allows cannabis farms to stack permits and sidestep what many believed was going to be a hard cap on the amount of acreage a single entity could cultivate. Many have expressed fears that the loophole gives large companies an advantage that could push small growers out of the industry. The association's board said it was dismissing the suit to "maximize existing association resources," "create a clean-slate and increase engagement with the incoming administration of (Gov.) Gavin Newsom." Well, it appears there may have been more to that story. Marijuana Business Daily reported last week on a leaked three-page end-of-year report from the association's board of directors, which paints a pretty dark picture, noting the association was $267,000 in debt, couldn't afford to continue the suit and indicated outgoing Executive Director — and Humboldt native — Hezekiah Allen had refused to share information with the board while operating "outside of Calgrowers financial policies." Allen, the report charged, had entered the association into $140,000 worth contracts the association didn't have funds to support. CGA Chair Nathan Whittington told Marijuana Business Daily the report was not an "accurate representation of fact." He praised Allen and said the association's actual debt is less than $80,000. The higher number used in the report, he said, was part of "a very heavy slant" intended to "light a fire under" board members and encourage them to commit to fundraising efforts. But Tawnie Logan, a former board member who helped draft the report, told Marijuana Business Daily that it was reviewed and approved by the board's executive committee and — as of mid-December — was an accurate representation of an internal audit conducted in the wake of Allen's September departure. For his part, Allen said the large debt was due to his operating under a budget that banked on the association's 45 board members having pledged to raise $5,000 apiece — pledges most apparently failed to keep. So it appears a subgroup of the board either knowingly submitted a false — excuse me, "slanted" — report to the balance of the board or the association crafted its 2018 budget based on quickly forgotten fundraising pledges, or some combination thereof. Any way you cut it, this is a very bad look for the association, which had cast itself as a lobbying powerhouse for the nascent industry that would advocate for small farmers throughout the state.